This secondaryantibody is specifically designed for the detection of multiple primary antibodies (polyclonal or monoclonal) of different host species in experiments where cells are simultaneously labeled without unwanted cross reaction. Our Abpromise guarantee covers the use of ab6565 in the following tested applications. Ab6565 was used at dilution 1/500 with the primary antibody ab6161 in ICC/IF. See the review on ab6161. Publishing research using ab6565? Please let us know so that we can cite the reference in this datasheet. Thank you very much for your interest in our products. I can confirm that ab6346 is tested and guaranteed for ELISA whereas ab6565 is not yet tested. Please find a testing discount offer below for ab6565. I attached protocols for indirect and direct ELISA for the information of your customer. These protocols and more can also be found using this link: https://www.abcam.com/index.html?pageconfig=popular_protocols I hope this information is helpful. Please do not hesitate to contact me again with any further questions. If you do, could you please include more information about the planned experiments of your customer? This will make it easier for me to help your customer with more specific suggestions. Testing Discount Offer: To our knowledge, ab6565 has not been tested in ELISA. Therefore, I can offer a discount off a future purchase if you buy ab6565 now, test it in ELISA and submit feedback to us in the form of an Abreview. It doesn’t matter whether the Abreview is positive or negative, we would just really like to receive your feedback. The discount would be to the value of 1 free secondary antibody. If you are interested in this offer, please follow these steps: 1. Reply to this e-mail to let me know that you would like to proceed and test ab6565 in ELISA. I will then send a discount code. This code must be issued before purchasing ab6565 so please wait for my reply before ordering. 2. Purchase ab6565 either by phone, fax, or online (www.abcam.com). 3. Test it in ELISA. 4. Let us know the results, positive or negative, using our Abreview system (this will take about 10 minutes and images are great if you have them!). To find out how to submit an Abreview, please visit: https://www.abcam.com/abreviews. 5. After the review is submitted to us, the discount code becomes active. Simply place your new order by phone, fax, or on the web and mention the discount code. The discount can be redeemed for any secondary antibody ordered and the discount code is valid for 4 months after issue. We are always pleased to obtain feedback about our products and any information is greatly appreciated! Even if ab6565 turns out to be unsuitable for ELISA, you will still receive the discount on your next purchase after your Abreview has been submitted. Please let me know if you have any questions about this offer and I would be happy to help you further. The Terms and Conditions of this offer can be found at: www.abcam.com/collaborationdiscount. Thank you for your response and for clarifying the cell types used in the experiments. I understand now that bEnd3 cells (immortalized mouse brain endothelial cell line) were stained for CD31. The protocol looks absolutely fine and it you have an alternative antibody which worked fine with these cells. I would like to reassure you that our Abpromise applies to your complaint since you purchased this product within the guarantee period. This means that in the event that a product is not functioning in the applications/species cited on the product data sheet (and the problem has been reported within 6 months of purchase) we will happily offer a credit note/refund to the value of the product purchased. I could raise either a credit note for the cost of one vial of ab7388 and ab7388 since you have alternative antibodies; or send you two replacement vials (one of each) free of charge. Please could you let me know how you wish to proceed with your enquiry? I look forward to hearing from you soon. I send in attach the protocol I used (that unswer to all questions of the inquiry). This protocol is optimized for a lot of antigens, namely CD31.... Fixative for 10 min at RT: PFA 4% Acetone PFA:Acetone (1:1) Wash 3x in PBS Permeabilize with Triton X-100 0,2%, 10 min, RT; Wash 3x in PBS Blockinh with BSA/PBS 1%, 40-60 min, RT; Wash in PBS Incubate 1st antibody, ON, 4ºC (rat CD31 abcam, ab7388) 1:50 1:100 1:500 1:1000 Wash in PBS Incubate with 2nd antibody in the dark, for 2h, RT (anti-rat abcam, ab6565) 1:1000 1:500 Wash in the dark Coverslip with Prolong Gold + DAPI. Fixative for 10 min at RT: PFA 4% Acetone PFA:Acetone (1:1) Wash 3x in PBS Permeabilize with Triton X-100 0,2%, 10 min, RT; Wash 3x in PBS Blockinh with BSA/PBS 1%, 40-60 min, RT; Wash in PBS Incubate 1st antibody, ON, 4ºC (rat CD31 abcam, ab7388) 1:50 1:100 1:500 1:1000 Wash in PBS Incubate with 2nd antibody in the dark, for 2h, RT (anti-rat abcam, ab6565) 1:1000 1:500 Wash in the dark Coverslip with Prolong Gold + DAPI. Thank you for your response. Though you have kindly provided some details, it would be much appreciated if I could get some more information which would help me identify the source of the problem. 1) Sample: Could you specify the samples used for the staining i.e. species, cells (cultured) or tissues? 2) Detection system: Have you used the secondary antibody successfully with another primary antibody? Do you think that the problem may come from the secondary antibody? Thank you for your understanding and co-operation in this matter. I look forward to hearing from you and hope to solve this problem as soon as possible. Hi! For experiment design, I want to know if this antibody would cross react with mouse IgG? I couldn't fine the reactivity information of this Ab in your company's website. Is there any information about this? Very thanks for your help!! Thank you for your enquiry. I can confirm that ab6565 Goat polyclonal Secondary Antibody to Rat IgG has been cross adsorbed against mouse serum proteins and has less than 1% cross reactivity against mouse polyclonal IgG by ELISA testing. I hope this information will be helpful to you. Should you have any further questions, please do not hesitate to contact us. 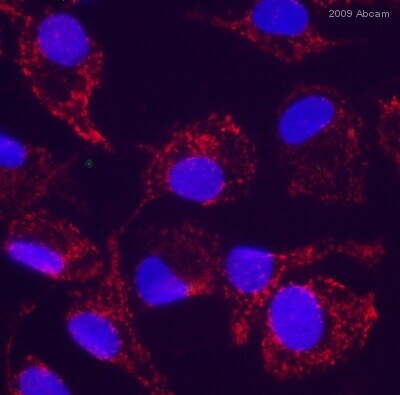 What is the concentration of this antibody? It is lot 168763. Thank you for your enquiry. The concentration of this antibody is 1mg/ml. I hope this information helps, please do not hesitate to contact us if you need any more advice or information. I'm afraid I have some fairly basic questions, but I need a quick answer from a reliable source! I'm interested in buying a secondary antibody conjugated to a blue fluorochrome. Firstly, is Cy5.5 a blue fluorochrome as well as Cy5 and if so what is the difference? Also, am I right in thinking that Cy5 and AF 350 are the only blue fluorochromes that can be purchased conjugated to secondary antibodies? I was also wanting to check if these antibodies can be visualised through a DAPI filter on a normal fluorescence microscope and a confocal laser microscope. Providing I am barking up the right tree with these assumptions, I'm looking for an anti-mouse IgG and/or IgM antibody and I'm also considering an anti-rat IgG and an anti-rabbit IgG to use for triple immunolabelling on primary cell cultures (oligodendrocytes) and on paraffin pre-fixed and/or fresh frozen cryostats. Can you give me information on which of these antibodies you supply and particularly any that are good value or supplied in trial size volumes! Thanks for your enquiry,unfortunately we do not supply sample sized testers. As far as I am aware both CY5 and CY 5.5 are red. If you log on to our web page and click on secondary antibodies there is a list of all the secondary antibodies we supply along with a fluorophore data table.